Countless people and communities around the world are building WikiSeats. Whether you’re a master at your craft, or you’re starting from square one, WikiSeat is an excellent way to level up your skills. Build a chair on your own, or with a partner. Be sure to document the process and share it, because we would love to see what you make! If you’re ready to get hands-on with project based learning, then WikiSeat is the perfect project for your class. This is a tested and proved way for students of all ages to experience abstract concepts. 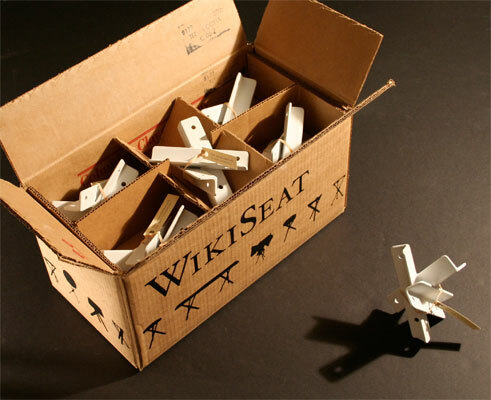 Set your own curriculum using the WikiSeat as a framework for your experimentation. We’re just beginning to experiment with the idea of being able to “check out building a chair” from the library. So far, it looks promising! Let us know if you want to experiment with WikiSeat at your library, and we can chat. How do I get a WikiSeat Catalyst? You can build one yourself using these instructions. You can purchase one from our online store. Or (depending on where you live) you can check one out at the local library. Where do you make the Catalysts? We are based out of Oakland California. All of the Catalysts are assembled by hand in our workshop. We are working on building a robot that will make them for us though. Do you have a curriculum available for teachers? Sort of. We have many example curriculums that have been put together by teachers who have used the project. But we do not want to limit the possibilities by creating a standard curriculum. Email info (at) wikiseat (dot) org, and we can provide examples, and introduce you to the teachers who made them. Donate time: Ask us how you can help make Catalysts for classrooms in need. Donate money: metal, shipping, and shop fees all seem to cost money. Spread the word! We’re on twitter, facebook, Instagram, and Flickr. There are also a few educators who are building catalysts locally, either on their own or by commissioning a welder, which is totally awesome. I am a grade 6/7 teacher in coquitlam BC. I am interested in your project and am wondering about how to purchase the catalysts? sorry for the late reply. You can purchase them through our store, but I encourage you to make them locally. All you need is a metal shop, and pretty much every city has one. Let me know if I can help in any way.